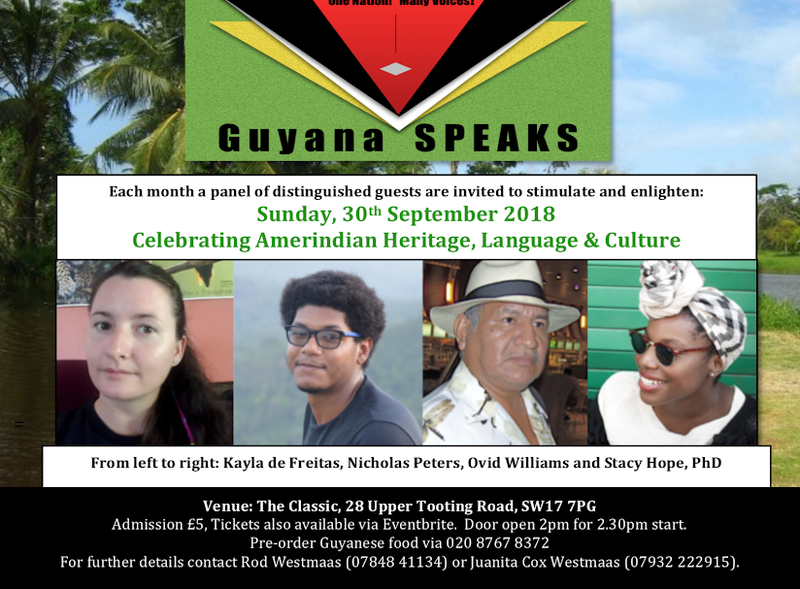 Guyana SPEAKS is delighted to be back after a brief August break, and to be hosting a programme on the Heritage, Language and Culture of Guyana’s indigenous peoples during Amerindian Heritage Month. Please come and join us on Sunday, 30th September, for what promises to be engaging event, including the opportunity to purchase Amerindian artifacts and to learn a few words in Wapichan. Our list of distinguished speakers and their bios is outlined toward the end of this email. In order to avoid the queues, please place your pre-orders with Tafawa Ntune by 8pm on Friday, 28th September. You can call 0208 767 8372 or email info@theclassic.uk. We’d be grateful if you could, as usual, circulate our flyer to all your friends and family. Kayla de Freitas grew up on Dadanawa Ranch, in South Rupununi, Guyana. She attended primary school in two Wapishana villages: Katoonarib and Sand Creek. She speaks Wapishana, an Amerindian language related to the Arawakan lingusitic family. She previously worked for 6 years with Conservation International Guyana, assisting in community development and resource use planning around protected areas. She has also been involved in working with community monitoring of the endangered Red Siskin. She recently completed a MSc in Anthropology, Environment and Development where she looked at how cattle rearing have become incorporated into the indigenous socioeconomic system. Kayla will speak about issues surrounding indigenous languages and aims to teach the audience one or two words in Wapichan. Nicholas Peters is a Guyanese writer and activist who recently moved to the UK to read for an MA degree in Human Rights at the University of Sussex. His written work includes A Centuries Old Flame which won the 2016 Walter Rodney Creative Writing Competition. Before completing his undergrad studies at the University of Guyana in English (Literature and Linguistics), Nicholas worked as a journalist at the Kaieteur News where he covered the indigenous affairs beat. He worked recently at the Amerindian Peoples Association where for two years his passion for advocating for the rights of indigenous people as well as the LGBTQI community were nurtured and flourished. Nicholas will speak about contemporary expressions of indigenous identity. Ovid Williams was born in the village of Paramakatoi to a Toshao, Francis Eric Williams, of the Patamuna nation. He attended secondary school at St Ignatius in Lethem, before securing a place at Queen’s College, Georgetown. In 1976 he was awarded a scholarship to study aviation and became the first indigenous aircraft pilot in Guyana. As a Flight Lieutenant in the Guyana Defence Force he travelled all over Guyana and learnt in the process to speak four other indigenous languages. He is editor of an as yet unpublished Patamuna dictionary and has a passion for the preservation of indigenous culture. While Ovid cannot be physically present, Guyana SPEAKS will share excerpts from a document he has been writing on the nine indigenous nations of Guyana: ‘The Real and Changing Worlds of the Indigenous People’. Stacy Hope, PhD is a Guyanese Anthropologist and Social Development Specialist working on issues surrounding indigenous peoples, gender, mining and climate change. She spent 18 months between 2005-2007, living in the Deep South of Guyana’s Rupununi Savannahs amongst the Wapishana/Wapichannao of Aishalton in preparation for her PhD dissertation. Stacy currently works for international multilateral organisations such as the United Nations and World Bank, as well as NGOs, governments and mining companies to ensure that indigenous voices are heard within the development and business frameworks, and that sustainable integrative policies are designed and implemented. Her talk will focus on issues of Amerindian Identity as represented in the Miss Amerindian Heritage Pageant.